A thug who left one man with a broken ankle and two others hurt in an ‘appalling and ugly display of gratuitous violence’ in a March street has been locked up for two years. Joe Tunmer attacked the three men in High Street, March in the early hours of November 29 last year. 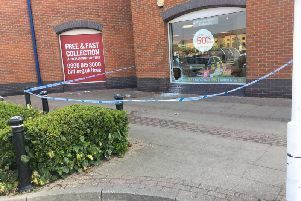 Tunmer (28) of Sealeys Lane, Wisbech, had been drinking before the assaults outside the Eastern Promise takeaway. Yesterday (Thursday) he was jailed for two years at Peterborough Crown Court. The court was told the first attack saw a man bundled to the ground, where he was kicked in the back by Tunmer. As he fell, he twisted his ankle, fracturing it. He then punched another man, before a resident, living near-by the attacks, came out to try and keep the peace. The man, a former soldier who has served in war-zones across the world, was then attacked by Tunmer and Lenny Evans (23) of East Drive, March. He was punched and kicked to the floor, before he was able to make his way back to his home. The court was shown CCTV footage of the unprovoked attack, which showed Tunmer walking away from the area twice, before returning to assault the other two men. Defending Tunmer, Ian Graham said: “He has pleaded guilty at the first opportunity to the offences. “He is ashamed and remorseful for his behaviour. Barnaby Shaw, defending Evans, said: “Since 2011 he has had a serious mental illness. When he takes his medication all is well. But if he does not take it, he lapses into drinking, and his behaviour becomes more erratic. Tunmer, who pleaded guilty to causing grievous bodily harm and two counts of assault occasioning actual bodily harm, was jailed for a total of two years. Evans, who pleaded guilty to one count of assault occasioning actual bodily harm, was jailed for six months.